Conserving electricity is important – both for your bank account and for the planet. And one easy way to waste electricity is by having a bathroom fan and light that do not work independently. Sure, the fan is great to have on during a shower, but it's unnecessary when brushing your teeth. By wiring the two separately, you can control each independently, resulting in a more efficient bathroom. Bathroom extractor fans are usually powered by the lighting circuit and have a "run on" function triggered by the light switch. They also usually have an isolation switch to allow for safe cleaning of the fan. Some bathroom fans also run by timer, meaning they are triggered by the light switch and then work for a predetermined amount of time after the light is switched off in order to clear the air in the room. However, because fans can be noisy or disruptive – or sometimes just simply unnecessary – it can be a good idea to be able to operate it separately from the light. Because of the inevitable proximity of water in a bathroom, the National Electrical Code has certain safety requirements for bathroom circuits. Permanent ground-fault and arc-fault circuit-interrupter protection must be installed on all bathroom circuits. 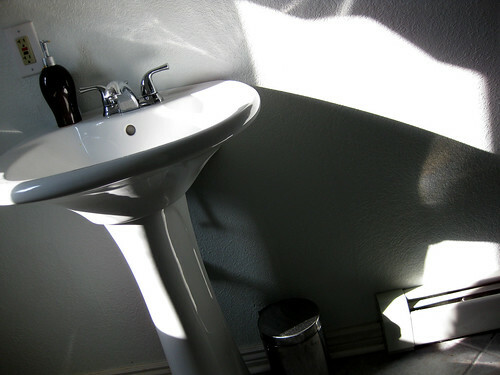 Bathroom wall receptacles are required next to and at a minimum of 3 feet from the edge of each basin. There should be a light switch controlled outlet inside the bathroom. When rewiring a bathroom circuit, safety should be your first priority. First, you'll need to turn off the circuit that delivers power to your fan and light. Take the switch out of the wall box and check again that the power is truly off. This is an important safety step, and not being careful can risk electric shocks. Next, remove the wires and track which are going into the fan section. Then, remove the lens and light bulb. Once your fan is free, position it so that you can easily access the connection box. Inside the box, you'll need to separate the wires to see which feed the fan and which feed the light. Connect the white wires, the ground wires, the black wires and the red wires together. You have essentially created two separate circuits within the connection box. Cover your new joins with electrical tape and put them gently back into the connection box. Close the connection box back up, and test your new independently wired light and exhaust fan. Having a ground fault circuit interrupter installed in your bathroom circuit is the best way to minimize risk of electrocution. Extractor fans in general also help with the safety of bathroom circuits by mitigating moisture build up from steam. Another essential safety tip is using splash proof switches on all bathroom devices, which allows you to safely turn things on and off with damp hands. Keeping your circuits separate can also help with bathroom safety, as a fault on one circuit will not interfere with another circuit. If your fan short circuits, your lights will stay on so you can fix it. If you're concerned about the safety of your bathroom circuits, it could be best to consult an electrician to check them over.